Ferdinand Berthoud is a new high-end watch brand within the Chopard Group that launched in 2015 and which sits atop of Chopard and L.U.C. Chopard. In the 18th century, Ferdinand Berthoud built marine chronometers that served as reliable scientific instruments and was appointed clockmaker of the French King and the French Navy. This company is a contemporary interpretation of that horological ideology with a pure focus on chronometric perfection. The Chronomètre Ferdinand Berthoud FB 1.3 has the same aesthetic and technical features of the previous versions that were respectively crafted in 18K white gold (FB 1.1) and 18K rose gold (FB 1.2). 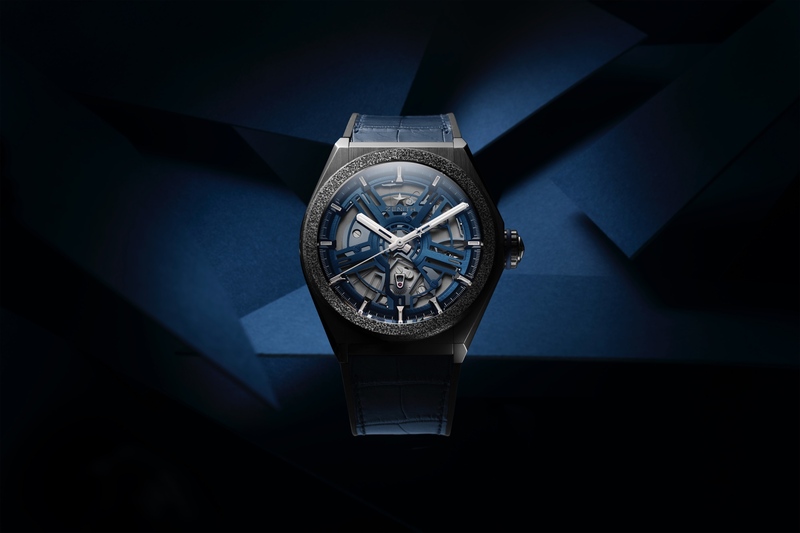 This new timepiece is presented in a 44 mm x 13 mm bimetallic platinum octagonal case with a domed and arched vintage style sapphire crystal with glare-proofing. Worth noting is that the case construction comprises two octagonal-shaped side pieces in polished platinum. Inspired by an overhead view of a marine chronometer fitted inside its case: the round shape is cut through by the arms of the gimbal suspension that holds it in place when the ship is at sea. The grey ceramic lugs are secured to the case middle by two titanium bolts. The same ceramic is also present on the medallion adorning the knurled platinum crown. Four sapphire windows (portholes) are cut out from the sides of the case provide a chance to admire the fusee-and-chain mechanism in action, as well as to allow light to flood through the movement. 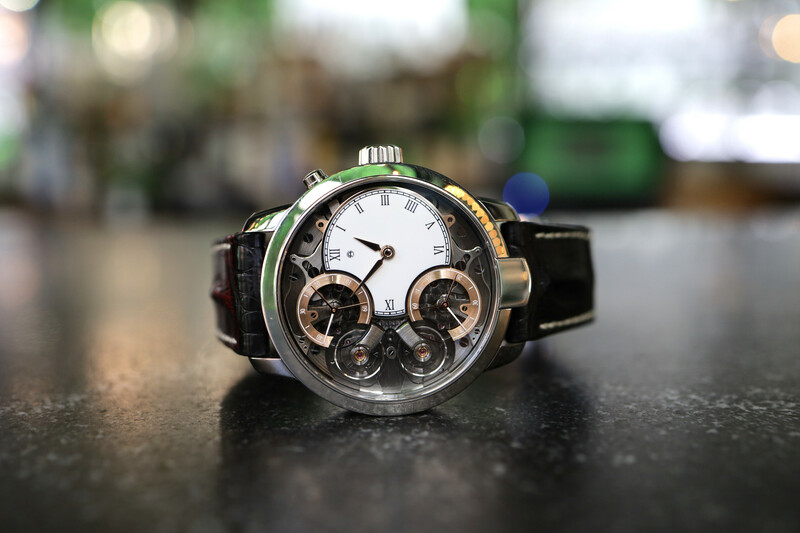 The dial is made of solid nickel silver with a vertical satin-brushed finish with the center cut-out revealing the wheel driving the tourbillon carriage and second wheel, which the central seconds hand is attached to. The slim black hand sweeps around a translucent sapphire railtrack circle around the rim of the dial. This is a unique and actually useful feature for a tourbillon. The hours and minutes are offset at 12 o’clock on a black lacquered subdial white Arabic numerals and white gold cut-out hands. The chamfered edges of the central and power reserve apertures are accented with black rhodium-plating. A seconds scale in matte translucent sapphire surrounds the dial. At the bottom of the dial reads the inscription “Chronomètre Val-de-Travers Suisse,” which is the watches origin. The hour and minute hands are 18K white gold and are dagger-shaped, openworked, and faceted. The arrow-shaped hand for the power reserve at 9 o’clock is in 18K gold and has been black nickel-plated. The long thin sweep-seconds hand is bronze with a black nickel-plating and a lollipop counterweight central sweep-seconds hand. Animating the functions is a manually wound movement, caliber FB-T.FC, which beats at 3Hz (21,600 vph), measures 35.50 mm x 7.96 mm, has 46 jewels and a 53-hour power reserve. The movement features a tourbillon with the fusee-and-chain transmission which delivers constant-force. The chain itself measures 285 mm and consists of 790 of the total 1120 movement components. This is no ordinary fusee, though, if there is even such a thing. There is a patent pending on this type of fusee, particularly the suspended design, with a differential based winding device. Additionally, there are three more patents pending. One for the suspended barrel with Maltese cross stop work device, another for the suspended power reserve device with the mobile cone, and finally one more for the suspended tourbillon with direct-drive seconds. The 12 mm variable-inertia balance wheel is made of copper-beryllium and is integrated 2 balance studs (gold-plated nickel-silver material). The balance spring is hand-shaped with a Philips terminal curve (steel). And the escapement is a Swiss level design. Every component is finished to the highest standards. Interestingly, the platinum crown is 9 mm, which is relatively large, but that is because it’s a dynamometric crown (uncoupling device), which I’ll go over in a moment. The winding mechanism is fitted with a pinion featuring cone-shaped toothing, together with a large-diameter knurled crown, enables smooth winding of the movement – a gentle motion that naturally enhances the quality of the rapport established between the watch and its owner, which plays an essential role in the case of a hand-wound watch. Equipped with a “Maltese Cross” stopwork device, this serves to limit the number of winding turns of the mainspring to around six and to use only the most stable portion of this spring – thereby breaking free of its far ends. This device also serves as a buffer when the barrel is fully wound. At that point, the mainspring torque exerts a 3kg force, which is considerable for components measuring just a few millimeters. To perfect the security of the movement, the engineers at made the crown with a dynamometric function to avoid any damage to the movement that might be caused by excessive winding. 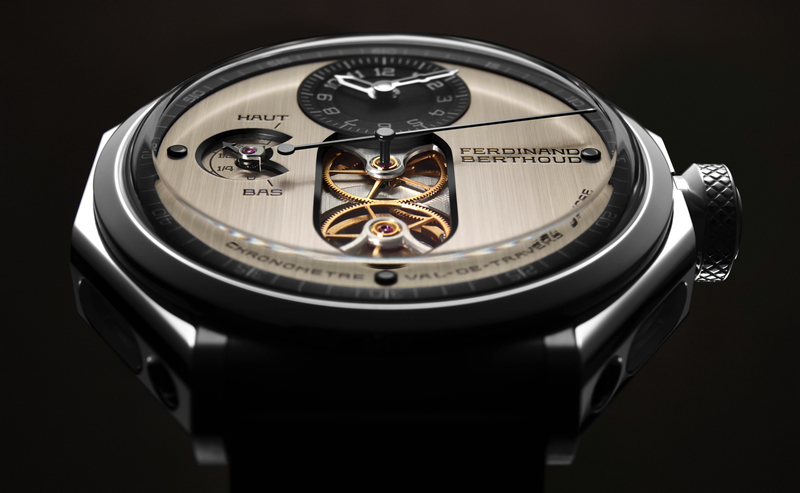 Learn more at Ferdinand Berthoud. Previous articleDoxaIntroducing the Doxa Sub 300 "Black Lung"